President Donald Trump also said that even U.S. aid to the Palestinian Authority will be withheld if the Palestinians fail to “sit down and negotiate peace” with Israel. The question of Jerusalem’s status, he confirmed, is no longer up for discussion. Trump admonished the Palestinians for “disrespecting” the U.S. by refusing to meet with Vice President Mike Pence during his visit to the Middle East last week. Palestinian President Mahmoud Abbas instead met with European Union foreign ministers in Brussels. In December, President Donald Trump affirmed that Jerusalem is the capital of Israel and promised to begin the process of relocating the U.S. Embassy in Israel from Tel-Aviv to Jerusalem. He said yesterday that “a small version” of the embassy will open next year. 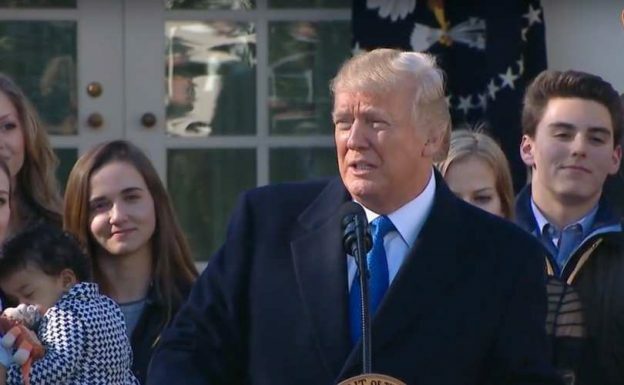 “I commend President Trump for his boldness to put the Palestinians on notice that Jerusalem is no longer a bargaining chip,” said Mat Staver, Founder and Chairman of Liberty Counsel, President of Christians in Defense of Israel, and Founder and Chairman of Covenant Journey. “The U.S. should not give the Palestinians another dime if they refuse to cooperate. We should not reward bad behavior. Rewarding bad behavior begets more bad behavior. President Trump’s affirmation that Jerusalem is the capital of Israel represents a positive catalyst for America and Israel,” said Staver.